These days, the last thing you want to deal with is financial difficulty. Let’s face it. With all the encouragement that the media provides for people buying beyond their means, it’s so easy for some to actually forget about financial responsibility and fall into that trap. There is nothing wrong in buying the latest HDTV or taking a cruise if one can actually afford it. Being financially organized can help people figure that out. 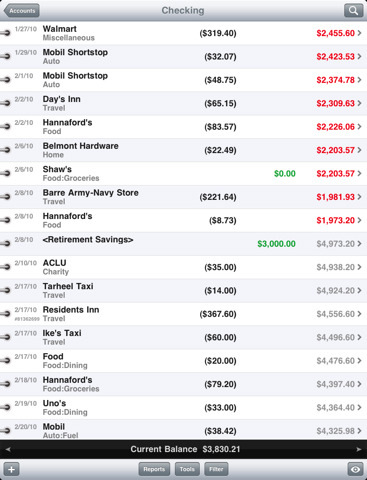 PocketMoney is a handy iPad application that lets users take control of their finances, track their expenses, and find out how they can achieve their financial goals. In order to become financially healthy, one needs to know how much is coming in, what are the expenses, and how cash flow looks like. 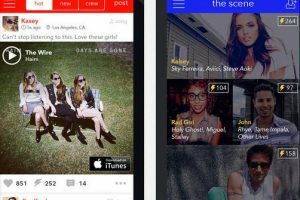 PocketMoney lets you do that and more. 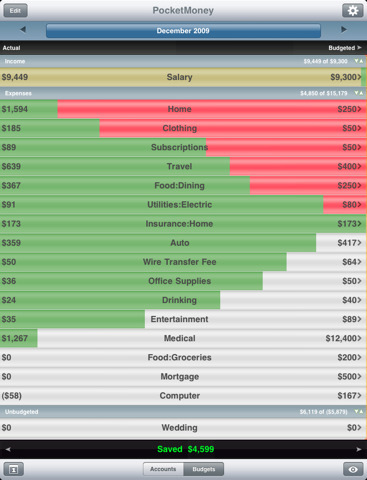 You can enter your income and expenses across multiple categories. Future transactions can be schedules as well. 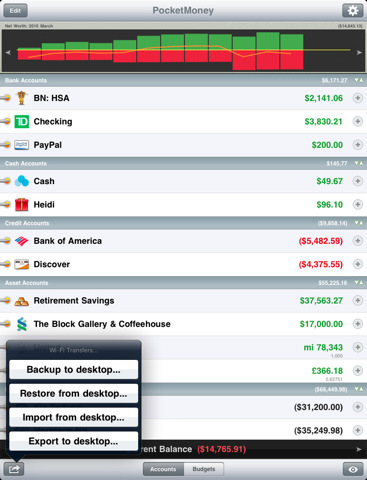 PocketMoney can keep track of your credit cards, checks, savings accounts, and more. It even auto-completes your transactions if you work with it long enough. You can attach photo-receipts to your transactions (through an optional enhancement). The reports and charts are the most useful aspect of this app. They make it easy for you to figure out your net worth, cash flow, and other information. PocketMoney can export/import your information and lets you back it all up as well. PocketMoney may fall a bit short when it comes to managing business transactions, but it does offer a wealth of useful features for personal financing. If you intend to become financially more responsible, PocketMoney could give you a good start.